White House press secretary Sarah Sanders told reporters that other presidential administrations also used nondisclosure agreements. Employment lawyers say that's not the whole story. Sanders was correct in saying government security clearances include nondisclosure agreements. But she mixed national security with presidential politics when she applied that standard to the NDAs drawn up by the Trump campaign and the White House. "The government does not impose nondisclosure agreements on former federal employees with respect to any unclassified information, no matter how 'confidential,' sensitive or embarrassing," said Bradley Moss, a Washington, D.C., attorney who practices federal employment and national security clearance law, in an interview with NPR's Morning Edition. Trump apprentice turned aide turned antagonist Omarosa Manigault Newman has made public the NDA she refused to sign when she was fired from her post as a White House senior aide. The agreement would have come with a $15,000-a-month job on the campaign committee, which she rejected. White House staffers have also reportedly been asked to sign NDAs as a condition of their employment even though the agreements are unlikely to hold up in court. Past White House staffers disputed Sanders' claim that nondisclosure agreements were common in other administrations. Ari Fleischer, a press secretary for President George W. Bush, wrote on Twitter, "On the NDA issue, it's simple: WH aides with access to classified info sign a form in which they commit not to disclose classified information to unauthorized people. 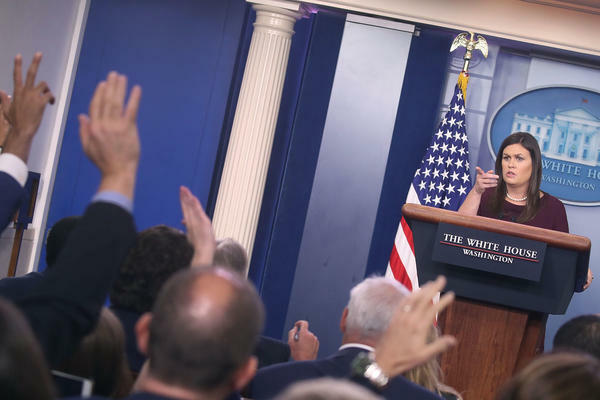 Beyond that, there were no NDAs while I was press secretary." Tellingly, it is Trump's campaign committee and not the federal government that is taking legal action against Manigault Newman by putting her into private arbitration, the specified remedy for allegedly breaking her nondisclosure agreement from the 2016 campaign. On Tuesday, Manigault Newman released recordings of conversations she alleges were with fellow campaign staffers in 2016. The NDA disclosed by Manigault Newman took an expansive approach to what information could not be shared without permission. One provision stakes a claim on any information preserved in "text, drawing, photograph, film, video...book, article, memoir, diary, letter, essay, speech, interview, panel or roundtable discussion, image, drawing, cartoon, radio broadcast, television broadcast, video [again], movie, theatrical production, Internet website, e-mail, Twitter tweet, Facebook page, or otherwise ..."
But that approach is too sweeping, said R. Scott Oswald, a D.C. attorney specializing in employment and whistleblower law. Oswald said a nondisclosure agreement's strength lies in its specificity. "Unless you've got some pretty specific provisions in an NDA, most courts are not going to uphold them," he told NPR. "If you can't find what is confidential about the information, it's not something that courts are going to protect." In the case of a presidential campaign, Oswald suggests confidential information that could be covered by a nondisclosure agreement would include voter data or specifics around campaign strategy. "It's really hard to define what precisely would be confidential within the context of a campaign," said Oswald. Even if an arbitrator ruled for Trump and hit Manigault Newman with a big fine, Oswald said, there would still be a long road for the president and his lawyers. Enforcement is up to courts, he said, and an injunction against Manigault Newman would be unlikely, "so as a practical matter most likely she's going to be able to continue with what she's doing." Manigault Newman's unsigned nondisclosure agreement, like others, contains a no-disparagement clause — a pledge to never, ever disparage the campaign, Trump, Vice President Pence, their families, their families' companies, and so forth. Oswald said the open-ended ban would be vulnerable to a legal challenge, since it would restrict speech about a sitting president. And such clause in a nondisclosure agreement issued by the White House would be unenforceable, said Louis Clark, CEO of the Government Accountability Project, which works with and defends whistleblowers. In fact, he said, government employees — including White House staff — simply can't be gagged like that. Congress has repeatedly passed whistleblower laws safeguarding government workers' communications with Congress and inspectors general. But Clark suggested that enforcing the NDAs might not be the administration's goal. "Clearly their purpose is to chill speech," he said in an email. "That they might do." Moss, the federal employment lawyer, agreed. "Even if the campaign loses this fight, this is about intimidation. This is about trying to put a warning shot out to anybody else who used to be part of the Trump inner circle and worked in the White House — 'Don't you dare step out of line; you better keep your mouth shut.' "